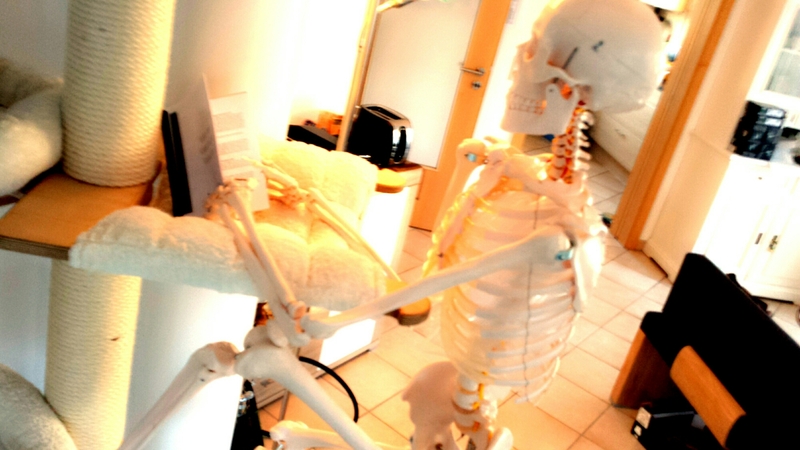 In my dôjô we me have a new member watching every class, it is a human size skeleton*. I decided to add this as part of our understanding of body movement. Each class is the occasion to show the students how a technique should be done. When they see the bone alignment, the joint logic, the technique begins to make sense. 骨 (Kotsu) regroups the secret principles introducing any of the ryûha but it also reads as bone. Maybe because these principles are the “skeleton”, the foundation of the system. Because we all have, at first, a sport educated vision of the martial arts, we miss the key point: which is to break the balance of the opponent. Thanks to the skeleton in the dôjô, the students are now able to visualize, in real size, the possible angles and the amount of leverage that can be applied to the joints at the skeleton level, therefore it is easier for them to get the technique correctly. The typical fight in feudal Japan between two samurai implied the use of the Yoroi. The Yoroi protecting the body from the ferocious blows of the enemy **, it is obvious that hitting the flesh of breaking the bones was not feasable. But if hitting the body was hardly possible, taking the balance by using the bone structure was easy. By locking the body inside the Yoroi and by manipulating the joints, it is easy to get the opponent off balance. A fight in feudal Japan was mainly about bringing the opponent to the ground in order to finish him before he could stand up. Trying to hit the muscles or to break the bones is sport. Understanding the laws of balance by integrating the knowledge of bone positioning and angles is budô. So don’t fight the flesh, but fight the bone structure. We are learning Budô not sport.